Home / Posts Tagged "Kyle Petersen"
How Far Away is St. Louis From You? You know why we are asking right? We’re opening up our new production facility and we’d love to get some of your screen-printing orders in the door to try us out. Maybe you’ve heard about the awesome screen-printed apparel services that Visual Impressions provides to our customers out of our Milwaukee production plant. One of our key leadership gurus, Kyle Petersen, moved down to St. Louis and we’ve built a shop around him. So now, that expert level of apparel decoration that you’ve come to expect from Visual Impressions, is now available 386 miles southwest of Milwaukee in St. Louis. Maybe that’s closer to you. Kansas City, Nashville, Louisville, Memphis, Indianapolis, and all points around in a circle…got something you need printed? Give us a holler! Kyle is ready to hit home runs for you! Maybe you are in the St. Louis area too and aren’t happy with your local t-shirt printer? We’d love to talk shop and demonstrate what we bring to the table. Here’s how you can get the party started. Call Jay Berman at (414) 586-5606 or e-mail him at jayb@visualimp.com. 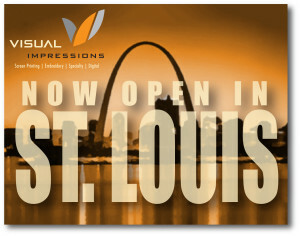 He’d love to have a casual conversation about your printing needs and our plans for our St. Louis facility.